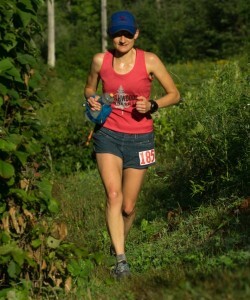 Founded in 1982, the Minnesota Voyageur 50 Mile Trail Ultramarathon is one of the oldest trail ultras in the nation. 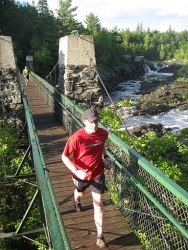 The race follows a rugged, varied, out-and-back course that takes runners on a journey from Carlton, MN through Jay Cooke State Park and heads northeast over difficult, rough woodland trails to Duluth, MN and back. Enjoy scenic overlooks of Duluth, MN and Lake Superior, the iconic Swinging Bridge over the St. Louis River, and the infamous Power Lines. The start, finish, and all race day festivities will be at Carlton High School. Weather for the MN Voyageur can be extreme. There have been several years when it was hot and humid, including 2003 when it was brutally hot with 90% humidity. In other years it has been cool, in the mid-50’s, and wet. Plan for everything except snow – at least not so far!! It’s never too early to start thinking about the Minnesota Voyageur, even if you are not lacing up the trail shoes in late July. The Minnesota Voyageur Trail Ultra and the Eugene Curnow Trail Marathon are always in need of dedicated people who are willing to give up a few hours of their time. Stop on in to our Volunteering area for more details, or drop us a line on our Contact Us page! There are many ways to help out – we’d love to have you on the team! Keep in mind, volunteering at the Voyageur gets you a discounted entry to the Eugene Curnow Trail Marathon, and vice versa. Come on out and see the races from both sides of the aid station table!